I feel like this year has just started but almost now we are in the ninth month. Time flies like anything and in this sense, I feel it is even faster than light. When I look back at the path I traveled this year it doesn't has much significant things to share except the awesome opportunity I got to meet my fellow bloggers from across India which has changed my view of blogging at least to some extent. Hope to get the same kind of exposure in the coming years. Both Gokulashtami and Ganesh Chaturthi kept me busy and that is the reason I stayed away from blogging for almost a month's duartion. I have a couple of recipes prepared for both the festivals which I will be posting soon. 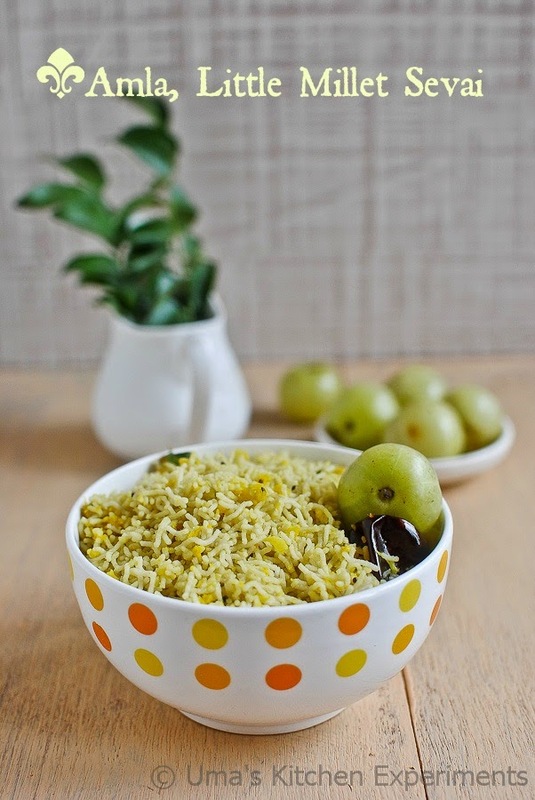 Coming to today's recipe - Amla, Little Millet Sevai is a my first attempt to make sevai using the millet based idiyappam. Since the idiyappam tends to dry quickly, it is better to consume it with vegetable stew or sweet coconut milk. 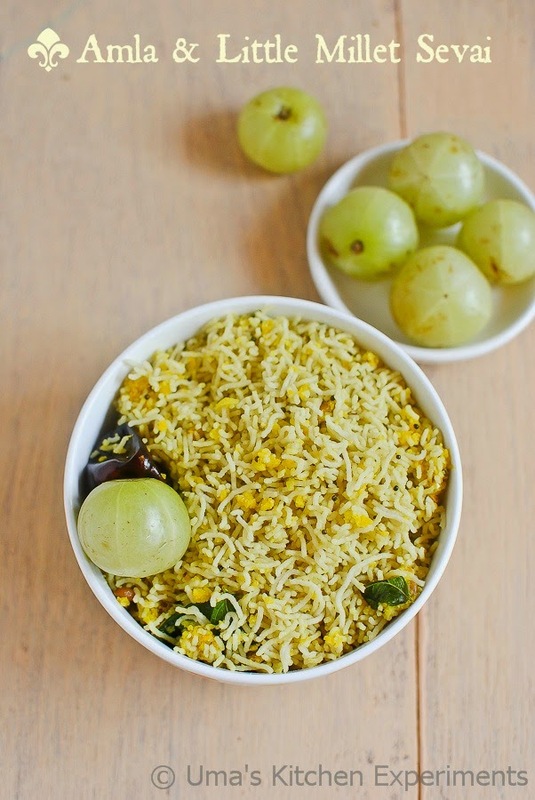 But you can try this sevai recipe when you serve it immediately after the preparation. Off to the recipe now. 1) Prepare Samai idiyappam as described here. Cool down and loosen it carefully. It tends to break very easily, so do it carefully. 2) Chop amla and grind it to a coarse texture using mixie. You can even grate it using a grater. 3) Heat oil in a pan. Add mustard seeds and channa dal and saute till the mustard seeds splutter and the dal becomes golden brown. 4) Add green chilli and crushed dry red chilli. Saute for few seconds. 5) Add grated or ground amla. Add salt and turmeric powder. Saute for few minutes without burning it. 6) Add a tablespoon of water and cook till the raw smell goes off. 7) Reduce the flame and Add loosen samai idiyappam and stir very carefully to mix well. 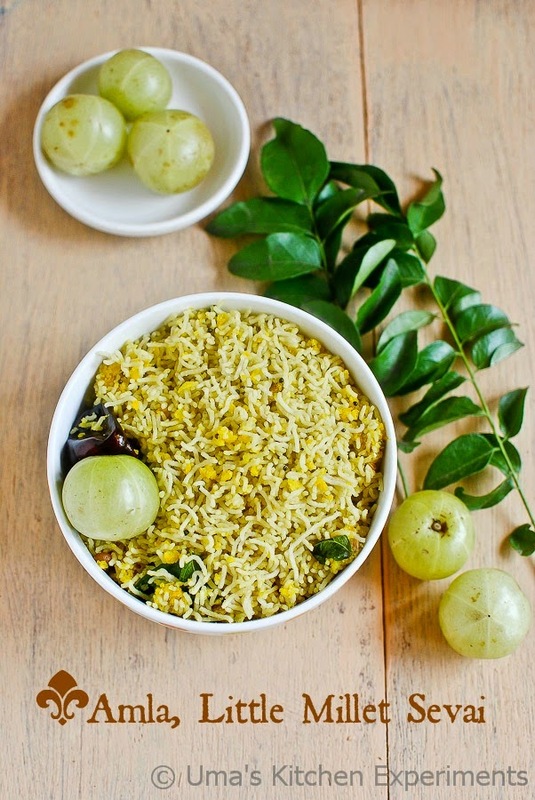 8) When the amla mixes well with idiyappam, turn off the flame and serve it hot. 1) Unlike the rice idiyappam, this samai idiyappam tends to break very easily. So prepare it carefully. 2) Recipes prepared from millets generally tend to dry quicker. So always serve them hot. If there is any leftover, sprinkle some water while reheating it. 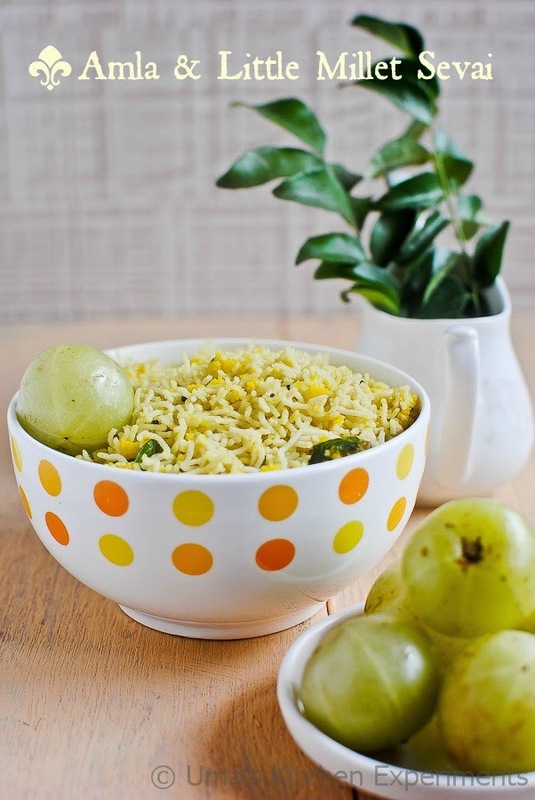 3) Amla sevai can also be prepared using rice idiyappam. Wish i get the bowl rite now, beautiful sevai. 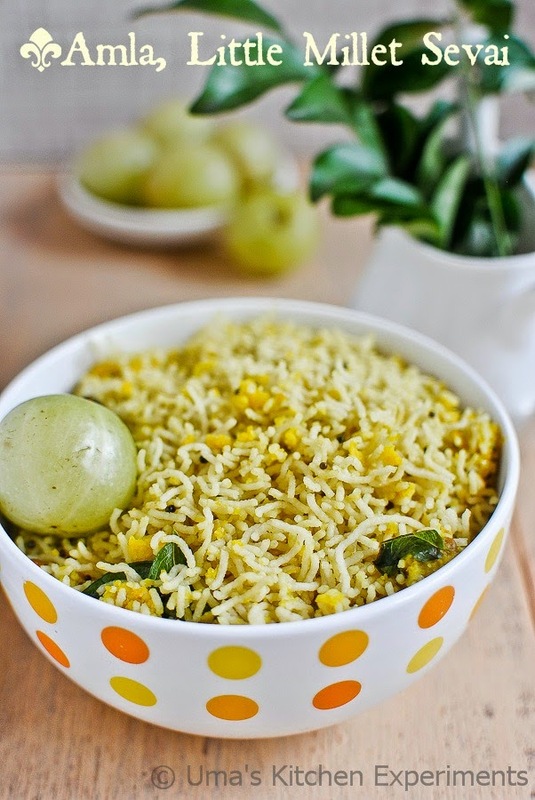 Healthy and tasty looking sevai. Very unique combination indeed. too healthy n yummy looking sevai.. i love such a twist to these idiyappamas..